Today’s aquariums are seemingly profane and mundane objects. However, a dive into their origins brings to light some quite surprising insights. In the 19th century, aquariums were conceived not only as scientific laboratories, but also as religious, even apocalyptic shrines. At the same time, they gave rise to artistic flights of fancy. This lecture discusses aquariums as challenging hybrids by the example of the naturalist, artist, and devout believer Philip Henry Gosse (1810–1888), the most influential popularizer of aquariums in modernity. is an art historian, journalist and musician based in various express trains. He studied art history, philosophy, media art and anglistics. From 2007 to 2009 he held a grant from the German Research Foundation for the graduate school Image Body Medium at the University of Arts and Design in Karlsruhe (HfG) where he was awarded his PhD for a thesis on the myth of Arnold Schwarzenegger in 2011. From 2009-2012, he worked as a researcher at the Swiss Institute for Art Research in Zurich and as assistant professor at the University of Siegen (2009, 2011-2013). He was appointed permanent lecturer at the Zurich University of the Arts (ZHdK) in 2012. Besides, he had teaching assignments a.o. at the HfG, at the Staatliche Akademie der Bildenden Künste Stuttgart, at the Akademie für Darstellende Kunst Ludwigsburg and at the Uniwersytet Artystyczny w Poznaniu (ongoing). From 2013–2016, he was co-head of photography at the ZHdK, currently he is head of theory of the BA Art & Media. He gave numerous lectures at universities and museums in Cyprus, Germany, France, Hong Kong, Italy, Canada, Lithuania, Mexico, Poland, Romania, Switzerland, Taiwan, USA. In his research he focuses on physical culture with an emphasis on bodybuilding, exhibition history, popular culture and pop music (focus heavy metal). Besides, he occupies himself intensely with all sorts of things. In 2013, he was the curator of the „Salon Suisse” at the 55th Venice Art Biennale, in 2015/16 he curated the exhibition „Building Modern Bodies. The Art of Bodybuilding” at the Kunsthalle Zurich. His essays and reviews appear regularly in, among others, Die Zeit, Süddeutsche Zeitung, Schweizer Monat, Camera Austria, frieze magazine. Since 2003, he has been the singer and bass player of the trash (without „h”!) metal duo Malmzeit who run a heavy metal delivery service. Uniwersytet Artystyczny w Poznaniu oraz Miasto Poznań zapraszają na wykład otwarty, który wygłosi dr Jörg Scheller. Prelekcja pt. 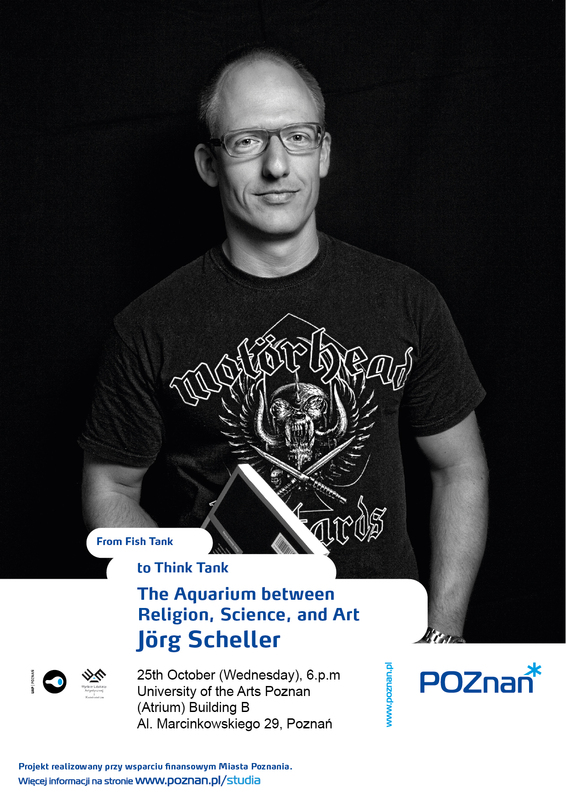 From Fish Tank to Think Tank. The Aquarium between Religion, Science, and Art odbędzie się 25 października 2017 (środa) o godz. 18:00 w budynku B (Atrium) Uniwersytetu Artystycznego przy Al. Marcinkowskiego 29. Jörg Scheller jest doktorem nauk humanistycznych, historykiem sztuki, dziennikarzem, muzykiem, anglistą, medioznawcą i kuratorem sztuki. W latach 2007-2009 był stypendystą ośrodka DFG Graduate School Bildbüro Medium w Staatliche Hochschule für Gestaltung Karlsruhe. Mieszka w Berlinie, wykłada na Hochschule für Gestaltung Karlsruhe, Staatliche Akademie der Bildenden, Künste Stuttgart, Akademie für Darstellende Kunst Ludwigsburg, Universität Siegen i Universität Zürich.